Burnham Abbey is one of the most complete monastic ruins in Buckinghamshire. It was founded in 1266 by Richard Earl of Cornwell as a house for Augustinian Canonesses. After the Abbey was dissolved in the 16th century, the estate and abbey building were leased to the Wentworth family. 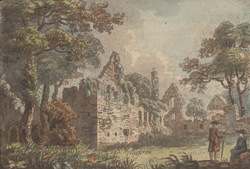 As this picture shows, by 1788, the abbey buildings had fallen into ruins and the site was overgrown. The artist is Henry Gilder (1750-p.1791), who lived with Thomas Sandby at Windsor and was probably his architectural assistant and servant. From 1779 to 1791, he worked as as drawing master in the Tower of London.